I’ve been doing a lot of desperation cooking lately. What is desperation cooking, you ask? Well, it goes something like this on an average Sunday afternoon…I look in my fridge and pantry and I have NOTHING (how is that possible?!) but I’m so hungry and I have to eat something and oh my word what will I eat, I’m going to starve and die and my cats will eat my face! But wait! There are seven completely random ingredients sitting around—what can I make??? The answer is generally something healthy, serviceable, and tasty enough, if not earth-shattering. This recipe was one of my better desperation-fueled culinary attempts, and definitely falls into that category. 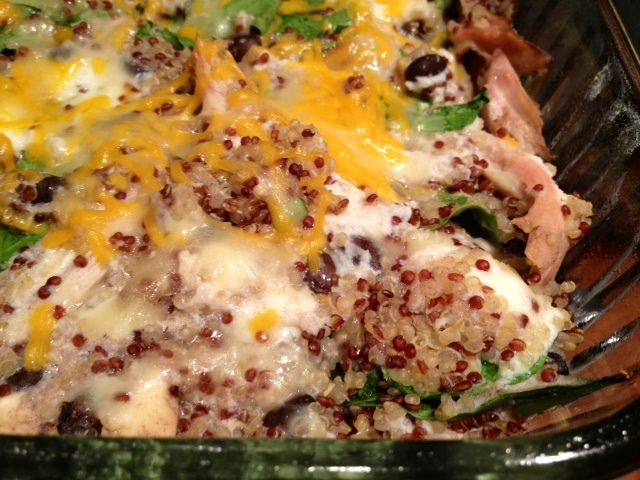 Great news is it’s good for you, with protein-packed quinoa and chicken, fiber-full black beans, and superfood spinach. And cheese. Always cheese. 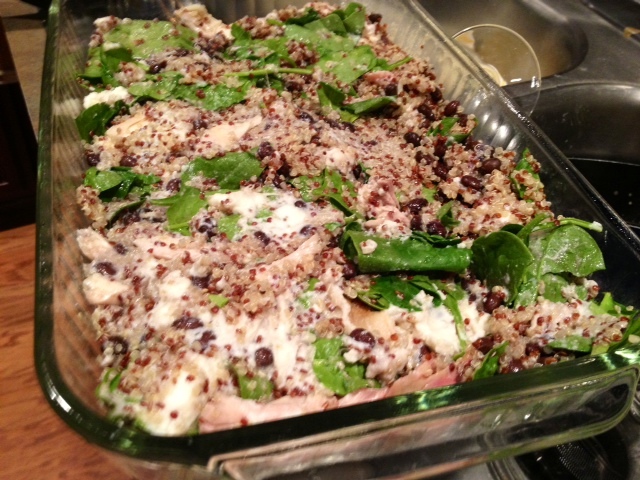 Preheat the oven to 375 F. Cook the quinoa on the stove according to the directions. You can use a rice cooker too, but mine has turned out drier in a rice cooker for some reason. 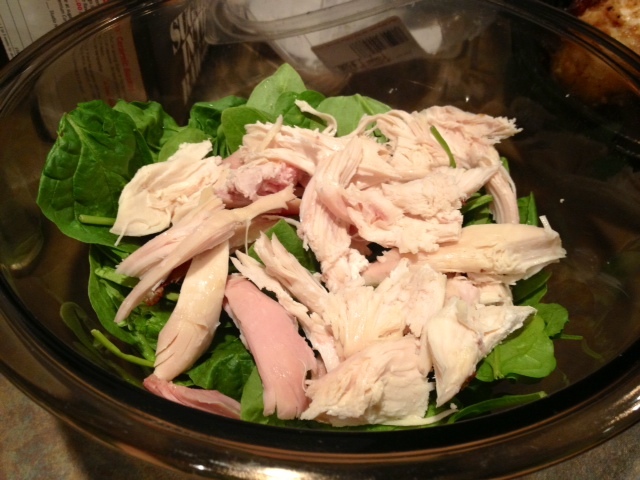 In a large bowl (bigger than the one I used, trust me), put a few big handfuls of fresh spinach and the chicken (make sure it’s thawed). 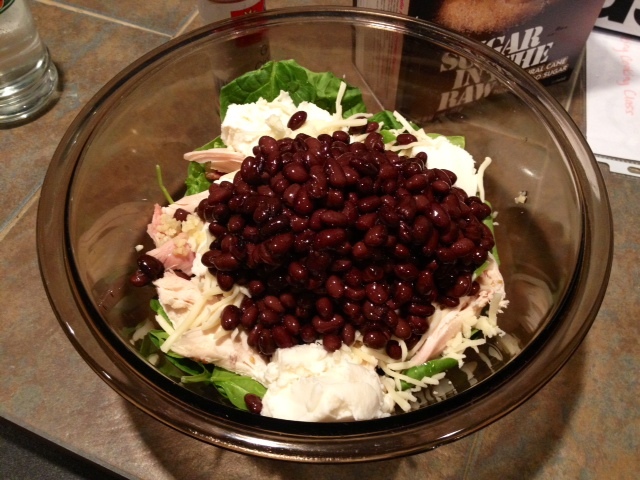 Add the ricotta, some cheese (I used parmesan), and the drained and rinsed black beans. 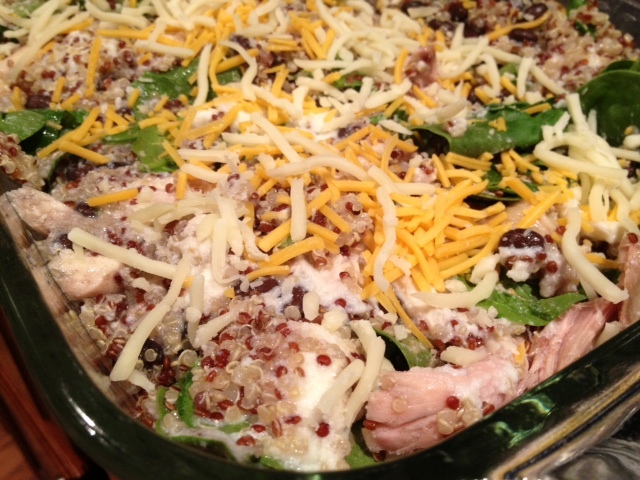 Once the quinoa’s done cooking and is nice and fluffy, add that too. Stir everything together and pour the mixture into a 9×13 pan that’s been coated with non-stick spray. Sprinkle with the cheddar cheese, but no need to go crazy. Bake for 20-25 minutes, until the cheese is bubbly. Cook quinoa according to the instructions (bring the liquid to a boil, add the quinoa, lower the heat to simmer, cover, and cook until soft, about 15 min.). 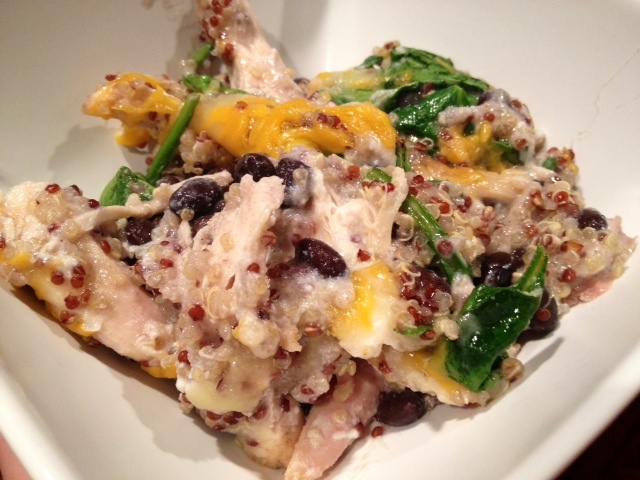 Combine the chicken, spinach, ricotta, black beans, and parmesan in a large bowl. 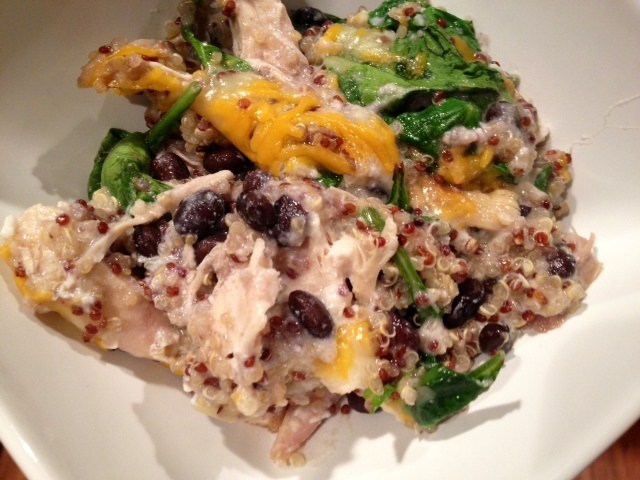 Stir in the quinoa, once it’s cooked. Spray a 9×13″ pan with non-stick spray and transfer the mixture to it, spreading until it’s evenly distributed. 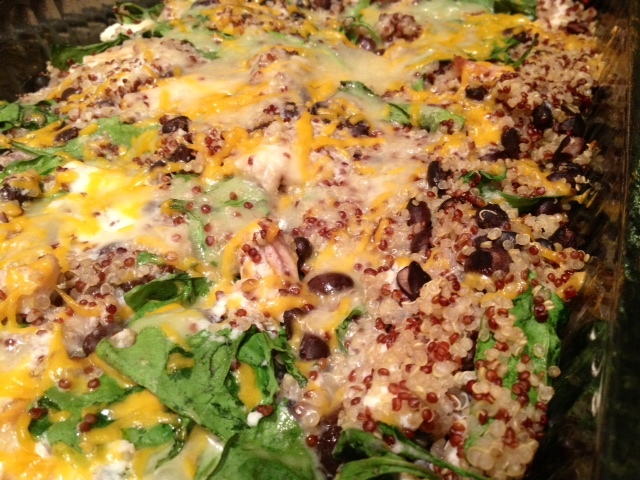 Sprinkle with the cheddar cheese and bake for 20-25 minutes.